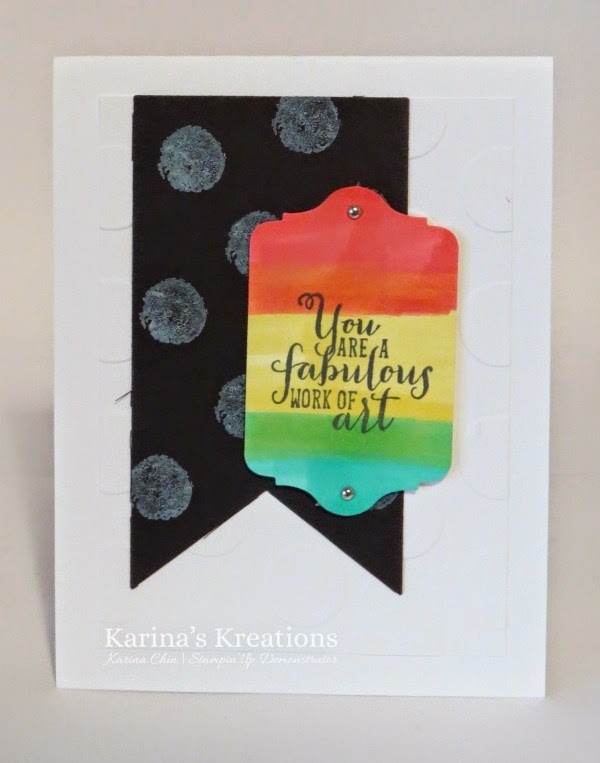 Karina's Kreations: Blendabilities Rainbow Technique! We made this cute card for Super Fun stamp night last Friday and at card class Wednesday this week. I wanted to share the technique with you because it uses the new Blendabilities markers and is really easy. 1) Fold the 4-1/4" x 11" Whisper White card stock in half to create a card base. 2) Place the 3-1/2" x 4-3/4" Whisper white card stock in the Large Polka Dot Embossing Folder #133739 and emboss with the Big Shot machine. Attach to the card. 3) Cut a pennant shape with the Banner Framelit die #132173 and Basic Black card stock. 4) Stamp polka dots with the Work of Art stamp set #134114 and Whisper White Craft Ink on the Black banner. 6) Cut out with the Chalk Talk framelits #129983. 7) Add two mini brads #122941 by using the paper piercing tool #126189. Here's the video for you too!